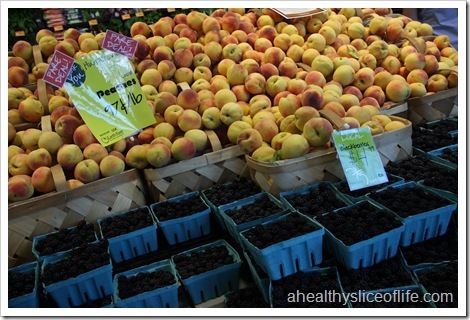 What Makes a Good Grocery Store? Yesterday was an exciting day in the life of a prego. Without the energy or physical ability to do too much nowadays, my fun comes in different forms… like spending a solid few hours playing in the kitchen, getting laundry done and checking out a new grocery store in town. 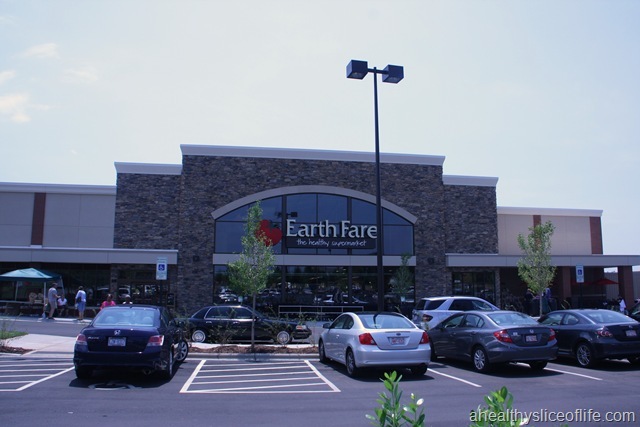 Anyways, big news in Lake Norman country… a new Earth Fare just opened up in Huntersville! 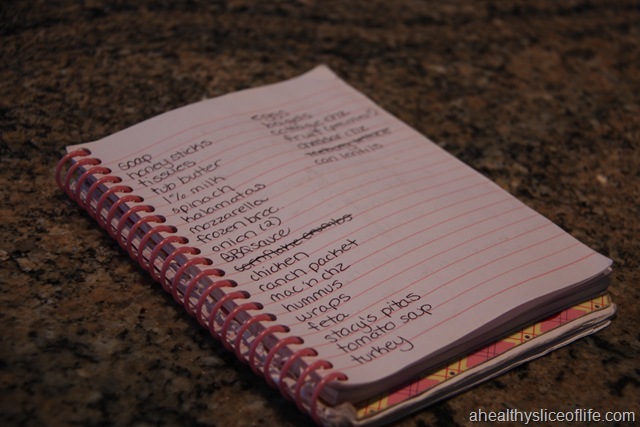 I was anxious to check it out, though a but nervous because my grocery list this week was better fitted for a conventional grocery store, due to needing items like soap and tissues. A friend of Hubbs has a huge garden and had given me a big supply of sweet potatoes, okra, tomatoes and corn, so I already had a lot of produce to work with for the week. To my disappointment, inside was just as packed as the parking lot. I get it- Sunday afternoon, new store, it’s going to be busy, but it was incredibly frustrating to try and navigate the aisles with a 9 month pregnant belly and a cart. It slowed down my shopping and stressed me out. Kids were running around, people were clogging aisles and I kept knocking into displays as I tried to navigate the store. They do have a bulk section. It’s not as extensive as some others, like at Healthy Home Market in Davidson, or the Whole Foods I used to visit in Atlanta. 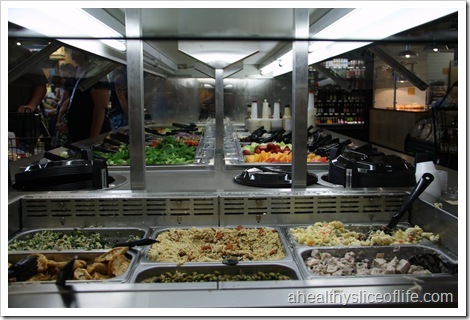 and lunch options, including sushi, pizza, juice bar, fresh salad bar, etc. YUM. I ended up getting most of my list at Earth Fare, but also stopped at Food Lion on the way home to pick up some items I knew I could get for less. Example: I love Cabot cheese, but Earth Fare didn’t have it and their least expensive cheese option was $1 more expensive than the Cabot cheese I usually get at the regular grocery store. 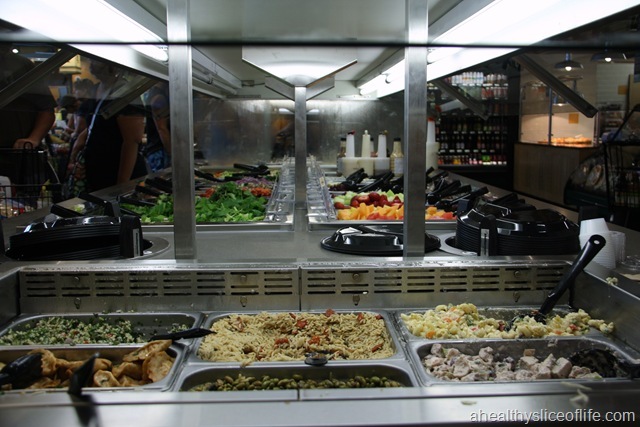 My overall take on Earth Fare was that I like it, but I’m much more likely to stop by for a delicious lunch than to buy my groceries there all the time. However, I could see me working it into my grocery store rotation if I happen to be in the area. Presence of everyday household needs, like soap and paper towels that aren’t outrageously expensive. 1 bar of soap for $3.99? No thank you. Variety. I like organic produce, but I don’t want to be limited to only fancy, expensive, organic bread for $7.00 a loaf because a store is too “high end” to carry Arnold Whole Wheat bread. Maybe it’s because of this pickiness, that I have to go to 2-3 stores a weekend to get the best of what I’m after. Am I too picky? 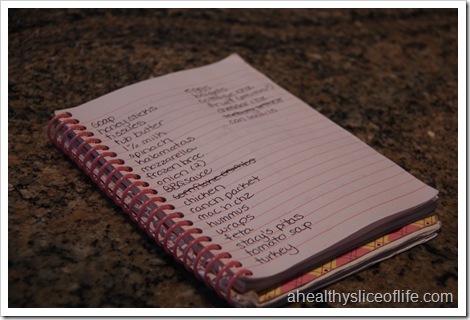 What is your favorite store to buy groceries? What is important to you in a grocery store? « Baby D’s CASH Giveaway! 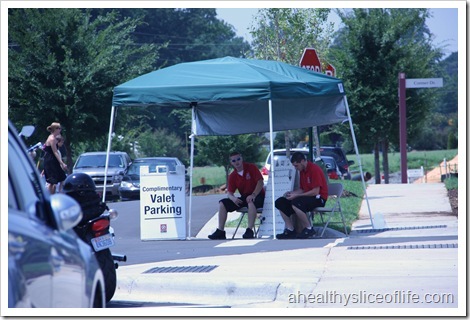 Valet parking? That is a GREAT idea!!! Fun to check out the new store, and not surprised it was packed. Just think, in a few years, it’ll be Baby D running around annoying the pregnant ladies! 🙂 Joking aside, I’m like you, I have a set few stores I go to mainly for price reasons. But it IS fun to check out other stores now and then. Have a great day soon to be Mama!! I buy most of my groceries at Costco, Target, Trader Joe’s or our local chain: Cub Foods. Costco is probably my favorite — they have most of our essentials, almost all of the produce is good quality (and so much of it is organic!) and it is cheap. Oh and close to our house which is good too! The new Earth Fare looks gorgeous! I wish there was one closer to me. My fave grocery stores and Whole Foods and Publix. Sadly, none are in the Charlotte area and grocery shopping always leaves me sad! I adore Earth Fare and Trader Joe’s. I usually go to Earth Fare for fun or to stock up on bulk bins items and save my larger shopping for Super Target or Harris Teeter. 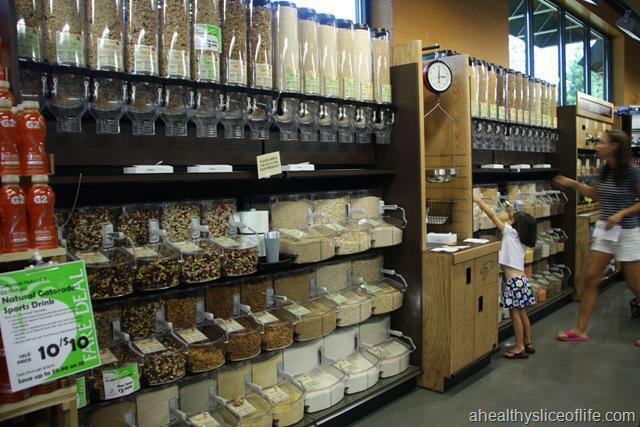 I’d love to find a super duper supermarket that had a huge health food selection, bulk bins, prepared meals, a hot bar, household items, and mainstream products all in one! I wish Whole Foods, Publix, and Cosco were all in the same shopping center so I could bust out all of my shopping in one session! That’s what I’m talking about… line ’em up! It would make my life so much easier. 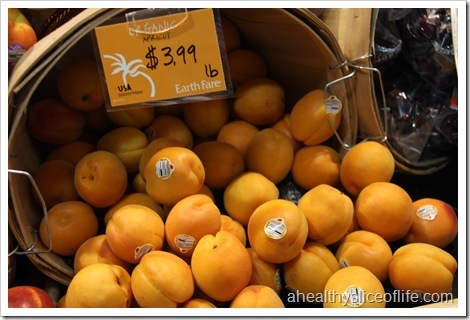 I could get along with a regular grocery store…With the addition of a bulk sectiOn and more local produce!! Hahaha I’m not pregnant but I LOVE checking out grocery stores 😉 It’s kind of crazy! There are so many good ones here in Richmond. Fresh Market, Whole Foods, Trader Joe’s, Martins, etc. That’s where I get most of my stuff. Kroger is good for the basics, but Trader Joe’s has SO much fun stuff. I could spend forever in there! Honestly, here in the Bay Area any grocery store that is clean, not busy, and parking is easy is my favorite grocery store to shop. Unfortunately, that rules out most Trader Joe’s and the local Whole Foods. I have a little gem that I currently shop at that I’m hoping no one else will discover, called Sprout’s. It has just about all that I need and the aisles are WIDE. Oh and they have half carts. Half carts rock. I’ve heard about Sprouts on several blogs… sounds like a winner! Ugh, I just moved and have to go through the trouble of finding a new grocery nearby. So far, no luck! 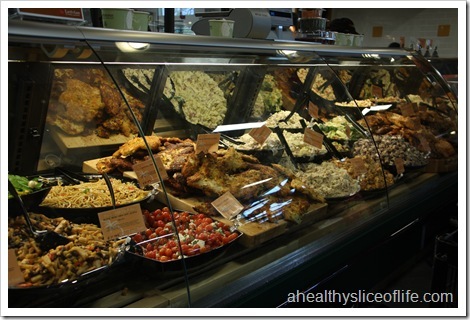 Fresh produce with organic options is a must and a big bulk section would definitely be ideal. And I totally agree about the bread thing. I hate going to Whole Foods and having to buy an $8 loaf of Great Harvest. I mean, it’s good, but it’s not worth $8!! i love earth fare but more for “supplemental” shopping and not the weekly haul. i am generally NOT a fan of going to any store (retail/grocery/etc) on grand opening weekends. i get so stressed out by the crowds. i can only imagine what the grand opening of whole foods in charlotte is going to be like. i think i’ll have to stay away for a week! My ideal store would be smaller, (think the size of a Trader Joes vs a Kroger or Costco), but would have a nice selection of organic produce, and would have decent prices for non-food items like paper products, etc… I could shop at Meijer and find great local organic produce, cheap paper products, and everything else, but the store is massive and I end up wasting hours just browsing. I would love to have everything you mentioned in my perfect store! I get frustrated with stores that only carry more expensive products. I had the best of all worlds when I lived in Iowa and shopped at Hy-Vee…they had an awesome produce and meat section and also had a great section for organic products as well. Oh, and the bakery was to die for! I miss it! I shop at Martin’s and the Farmer’s Market mainly. Martin’s has a huge selection of organic foods (not always produce though! That’s what the Farmer’s Market is for!). And Martin’s has a good selection of gluten-free options which has been super helpful. They also run great specials each week and I can usually shop around those to get the best prices on things. I have never heard of Earth Fair before but it does look like it has a lot of good produce! 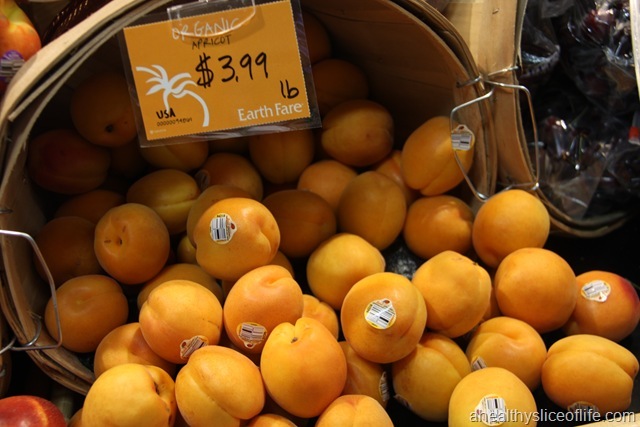 I LOVE fresh apricots! What a nice grocery store. 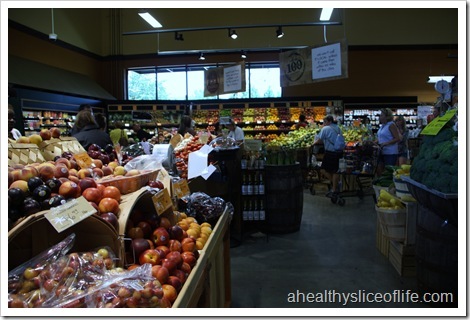 What is important to me regarding a grocery / fresh produce store: That the produce is fresh and not over ripe or damaged. We have a fresh produce store here in SA, where it looks similar than the pictures in your post and what I love about them is how fresh everything is. There’s nothing worse than over ripe and damaged products. Hi Brittany! 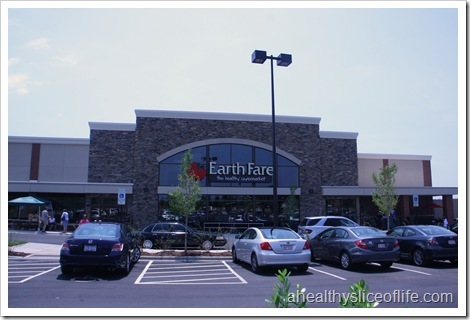 The hubby and I checked out Earth Fare this past week too… loved it but it was definitely packed. 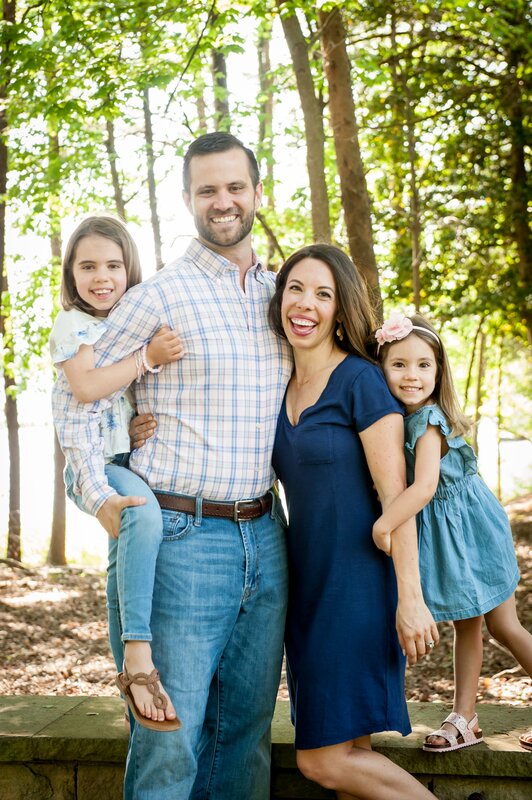 We are up in the Lake Norman area so I was excited to have another option other than the Healthy Home Market (which I love). Funny story… Donald Sutherland was there shopping and I completely stalked the aisles till I spotted him lol. Anyways love your blog! Hip Hip Hooray for Earth Fare!!! I just moved to the area from Cleveland, Ohio and now live across the street from the new store in Huntersville. I have been there twice since they opened. I am so happy because it is a quick walk away. Today I actually went there and to Fresh Food Market. 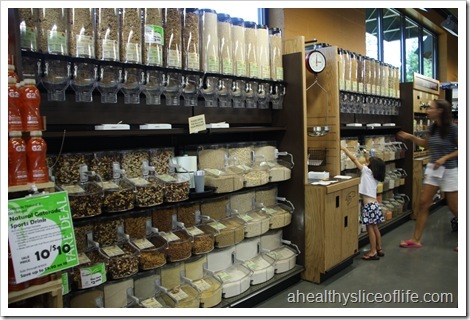 I love these specialty stores and I am looking forward to Whole Foods coming. I will def make the trip down there to shop. By the way congrats on baby D’s soon arrival. I have been following you since you made the announcement and I can’t wait to see if it’s baby boy or baby girl!